Whether its a camel safari for two or sundowner drinks on the plains- romance is in the air. 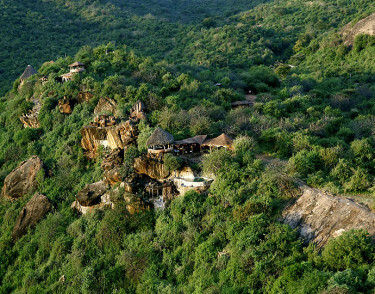 Immerse yourself in the Kenyan bush, meet local Maasai, identify useful plants and track animals. Relaxing in the pool is a quiet, magical way to spend your days. Learn about the pastoral life of the local Samburu and Laikipiak Maasai. The Ewaso Nyiro River offers rocks for jumping and rapids for tubing and is great fun for all the family. Fish the river with handlines to catch Barbels, Catfish and Tilapia. Head out on a nature walk and learn what berries can be used for poisoned arrows, how to track a warthog and much more. Learn to identify the birds and the bird calls. As well as jeep safari, guided camel safaris are one of this camps specialities.